My father John Strevens, was born in east London. He managed to earn a living painting portraits and other pictures, supporting his first wife and their three daughters. After she died, he met and married my mother and then I was born, so he had to work hard and sell hard. My mother, Julia Marzo, had left her native Barcelona after the Spanish Civil War, to go to France and then England. She met my father when he was in his early fifties. We lived in London, then spent a while in America where my father had some portrait commissions. When I was six, we moved to the outer suburbs of London. From very early on, I painted and drew alongside my father in his studio. In the holidays I spent many hours in the back of a car travelling to and from England and Spain, across France. Then I spent a lot of time walking to and from school with an increasingly heavy bag and sitting in front of a desk studying for exams. I still carry a heavy bag. After graduating from King's College, Cambridge, I moved to Paris to study painting at the Ecole des Beaux-Arts (Ensba). I have stayed put in France ever since. I’ve done many jobs to earn a living. I used to copy old masters at the Louvre. I translated art books, including the letters of Claude Monet and a huge tome on Matisse. I held painting classes for children and still enjoy working with kindergarten children. In 1990, when my son Thomas was barely 5 years old, I wrote and illustrated my first children's books; a series called Toto’s Travels. I didn’t realise how lucky I was to find a publisher (Little, Brown UK) so soon for these first books. In 1993, I joined the design team of an international multimedia company based in Paris creating quality CD Roms for children. I began to draw and paint directly on computer with a digital pen and tablet. This was liberating. I could play around with colour in virtual 'gouache' and I did not have to wash my brushes afterwards. When my daughter Ella was born in 1995, I went back to working from home in the old cathedral town of Senlis, north of Paris, where my artist husband Mick Finch also has his studio. My multimedia experience gave me new ideas for children's stories and games. En voiture and En bateau were two pull-out play books that took me a long time to develop. They were bought by a reputable French company but never published for packaging reasons. Still, this led to a lot of other work. My illustrations feature still regularly in a number of lively French children's magazines, and are reprinted worldwide. For my first book with Little Hare, Margaret Wild's Kiss, Kiss! I had fun researching central African wildlife, insects and landscapes. The story is about little hippo’s first discovery of the environment beyond his mother. Frances Watt's This Dog Bruce is a book about a dog who wants to play with other farm animals but doesn’t go the right way about it. I came indoors for Knock, knock! with David Bedford. Alongside the musical sounds and the “Who’s there?” guessing game in this flap book, children will spot other things going on. Years of working on magazine posters and graphic games for pre-readers, led to Les Petites Mains Dessinent, published by Bayard in France and conceived with Marie-Pascale Cocagne. Each large page is a story picture that a child can complete with their crayons. It’s a challenge to keep things simple and leave space for others to draw! In 2006, I completed Bridget’s Book of Nursery Rhymes. Like many illustrators before me, I have tried to give a new slant to some favourite rhymes from Mother Goose. I’ve also included a few less well-known rhymes like Cross Patch, and Jumping Joan because I love how they ring true for little ones coping with anger or playing alone. In Philemon Sturges’s How to Make a Baby Smile (HarperCollins US ) there’s a funny parallel in the poem between human and animal parents and babies of many different kinds. To help link the human baby to the ‘real’ animals which I show in their natural habitats, I decided to give the baby toy versions of all the animals, to snuggle up with on the last page. 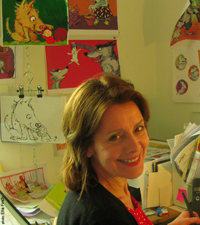 As SCBWI International Illustrator Coordinator, I take part in conferences with other children's book creators in France and elsewhere in the world. I also teach at Parson's Paris School of Design where I enjoy sharing with the students my love of originally designed and illustrated books.